What are the results of a success-with-style roll on a skill check vs. passive opposition (e.g. a skill roll that isn’t combat)? What are the results of a success-with-style roll on an opposed roll that isn’t combat? How do you handle allied NPCs? Can you use Mob rules or is that only for enemy NPCs? I was sketchy on what skills you can use for Defend and how/when you can use something besides Athletics to defend. I believe someone said Free Invokes could only give you a +2, not a re-roll. Is that correct? A Star Trek rules specific questions — how should skills work when Extra’s are piloting an enemy ship? I noticed that players sometimes get confused when tallying up their skill modifier, adding any stunt bonuses, adding the dice results, and comparing against the GM’s opposing number. If that were the end of it, it would be OK, but as we turn in the Fate Point tokens, and folks spend additional Fate Points to do re-rolls, we sometimes forget how we got to those original numbers. 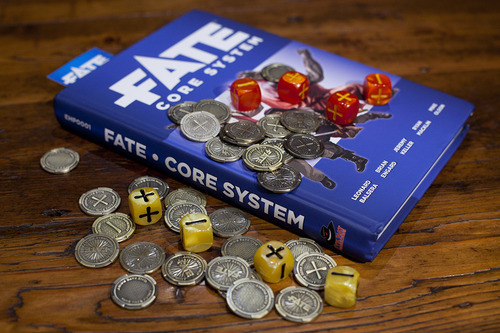 I’m wondering if there are some best-practices like putting all your Fate Point tokens on a special mat so you can track how many Aspects you’re invoking or some other way to help players and GM alike keep track of the math as you progress through your evolving numbers to get to your final results. Conversations ongoing about this on Google+. Alternative way to track Aspects. I like the savage worlds system better. I loved the games that I get to play in, but in my opinion, the savage worlds system allows more role playing, and dramatic moments. Fate is a bit “fuzzy” and yet can bog the game down. And I think savage worlds has enough flexibility to give a group what they are after. IMNHO.